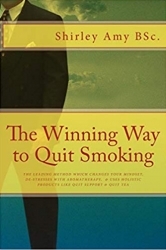 Announcing the new edition of The Winning Way To Quit Smoking” by Shirley Amy, BSc. This Winning Method unlocks the secrets to quitting smoking for good. It is designed to turn smokers lives around, and make their lives fantastic, healthy and happy. And all they have to do is to reduce their cigarette intake by 10% a month, while they systematically build up their physical and mental strength with cutting-edge holistic supports and suggestions. New York, NY, September 27, 2018 — British Holistic Health Guru, Shirley Amy, BSc., has just brought out a new edition of her cutting-edge book, “The Winning Way to Quit Smoking.” Unlike other cessation methods which involve pharmaceutical options that can have dangerous side effects, and do not have a high success rate, The Winning Way method is derived from a natural and holistic foundation. It incorporates health science, and embraces complementary therapy with an accent on regulating the body's processes, and the essential healing of the mind, body and soul. The guidance readers are given is not just for the period of the Winning Way's method, but for their life after cessation as a non-smoker. This is especially important for long-term and heavy smokers, as various elements they will learn about may help to regenerate their body, and make them less vulnerable to potential diseases. Chapter 1 “I'd Walk a Mile For a Camel.” This opening chapter will allow readers to fully understand that brain events, mental events, and the entire body’s biological functioning are intimately linked to the non-stop merry-go-round which keeps them firmly anchored on the addiction pathway. Chapter 2 A Hundred Trillion Garbage Cans. This chapter takes an up close and personal look at the alarming cellular damage caused by the non-stop onslaught of toxins which keep smokers in the loop. It examines the knock-on effect to all the body’s tissues and organs and then turns to detoxing – the gateway to optimal health and cessation. There are numerous easy and practical methods to choose from, all of which can be immediately incorporated into the readers' daily routine. Chapter 3 Health Cuisine. In the spirit of optimum nutrition and tasty food, with referrals to the Harvard School of Public Health, Department of Nutrition, this chapter shows readers countless ways to gradually upgrade their nutritional status with foods they will like, without worrying about counting calories. With recent research indicating that food and food concentrates may be capable of modifying genetic damage, this book sets a precedence for striving for the very best when readers make their food selection. It clearly explains how smoking changes the body’s digestive functioning, and allows readers to work out a program which avoids the helter-skelter blood sugar highs and lows which make smokers yearn for more cigarettes. Chapter 4 The “S” Factor. This chapter explores the stress cycle created by smoking. It puts the magnifying glass on the stress factors that are typical in today’s society, to see how they impact smokers' psychology and physiology. There is also a brief look into the nervous system which compounds the difficulties and keeps smokers in the groove. A wide range of practical solutions are offered for readers to chose from. These include: various uses of calming and uplifting aromatherapy essences (from inhalation to easy self-administered mini-treatments); relaxation techniques, and so on. Chapter 5 “Fuhgeddaboutit!” The title of this chapter is geared to enable readers to permanently forget about smoking. It was inspired by the expression of the much loved rogue mafia boss, Tony Soprano, from the fantastic HBO world-wide smash hit “The Sopranos.” The chapter's content is designed to build up readers' strength and willpower by getting them to see what they are doing to themselves in ways that they could not have previously imagined. Chapter 6 The Prep Period. This chapter prepares readers' entry into the “Cutting Down Period.” They will be asked to fill in a cigarette dairy, so that they can zoom in on their general smoking pattern. A list of unique things to do to take their mind off smoking when they are feeling vulnerable, is also put forward. A number of natural cessation products which form part of the Winning Way's method are discussed. During this period of time, readers will get in all the supplies they will need, for example: herbal quit smoking patches, Quit Tea, Quit Support, Quit Picks, Rescue Remedy, natural sleeping aids, aromatherapy essences, and a hypnosis CD. Chapter 7 The Cutting Down Period. Here readers are guided through the ways to successfully achieve gradual cigarette reduction. This process is tailored with clear to follow suggestions, and a long list of things to do when they are feeling the nagging urge to smoke. At this time, the permanent back-up of various Winning Way method mainstays and techniques, along with supporting products, should be firmly in place to help them reach your end goal. Chapter 8 The Permanent Quit Zone. After graduating from the “Cutting Down Period,” and readers are down to zero cigarettes, they will find that the elements of the Winning Way method still remain as a steadfast support for them to tackle any urges to smoke. The wonderful and far reaching results of giving up smoking are listed in detail, and looking after their future health is addressed. There is also a safety net for readers who enter the relapse stage. Chapter 9 Weighing In! This chapter examines how nicotine suppresses the appetite, and burns up calories quicker than normal. It also allows readers to understand the inevitable changes that cessation brings, and how they can make positive adjustments to their lifestyle to counteract weight gain. It also puts the spotlight on cessation and weight gain studies, evaluates some of the biological and physiological changes that quitters face, and gives guidance on taking positive action through an enjoyable healthy diet, specific supplements, an age old remedy, and moderate exercising. Shirley Amy BSc. is an English Holistic Health Specialist with an avid interest in the areas of Quitting Smoking,Optimum Health, Fitness, and Positive Lifestyle Change. She holds various University and College qualifications in the fields of Health Science, Nutrition, Holistic Therapy and Aromatherapy. She is also certified in Fitness Training. Shirley closely follows the smoking cessation industry, with a view to establishing integrative methods to help people succeed. She holds a particular interest in the key areas of worldwide evidence-based documented research on the effects of smoking and other negative lifestyle factors; this includes the opinions of Leading Scientists and Physicians, some of whom are Noble Prize Winners. This includes current cutting-edge research in the fields of: biochemistry, genetics, immunology, and life extension. Shirley’s philosophy is that Feeling Great and Real Health are not just the absence of disease, but a dynamic state of mind and body – and in the case of successful quitters, an individual’s “Feel-Good Factor” where he or she doesn’t have the urge to light up – as they just don’t need to. Shirley has lived and traveled in various diverse parts of the world. Through these experiences she has had the opportunity to study first hand, various cultures and practices related to holistic health, nutrition, general well-being, aging; and the impact of stress in all its forms, and the different ways that people deal with it. This knowledge has made a huge contribution to her health guru status. Shirley is also the author of three highly acclaimed Books on Latin-American Dance (under Shirley Ayme), which are studied all over the world. Two have been featured in a Universal Pictures Film.